Pentax camera's good for ultraviolet photography? Hello. I was looking for equipment to do ultraviolet photography and recently discovered on kolarivision website list of unmodified camera's showing their IR-cut filter tranmission spectrums. Was surprised to see spectrum differences or each camera's. Some have great UV blocking capability as normal spectrum camera should have but some actually are so sensitive to UV that they pick up even deeper UV spectrum what is great for UV photography because there's no need to modify full spectrum camera. Normally IR-cut filter needs to be removed since it blocks UV and replaced with hot mirror like Schott BG40 or s8612. 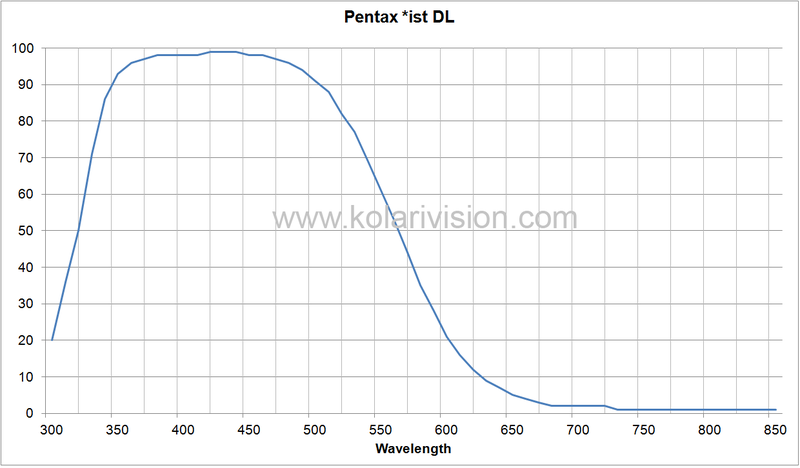 One in particular interesting to me was Pentax *IST DL camera which has amazing UV tranmission, over 90% in 350nm range. For that I would like to get 49mm filter or this camera. What model IR-cut filter they use there, maybe Pentax has newer models with such filters? Interesting chart, somehow I'd missed that on the kolarivision page. I have a K-01 and K1 both converted to full spectrum, mainly for IR but have been starting to get into UV a bit. The issue I've had most with UV is finding lenses that transmit UV at 50% or more. Most modern glass (age of autofocus forward to modern) is designed so well that UV cut filters are not needed much anymore. I'm using both 340 and 360nm filters in front of lens and stacked with either the bg40 or s8612. So far I've come across only four of my lenses that transmit at these wavelengths (50mm Steinheil /340, 35mm Zeniton /360, 50mm Domiplan /360 and Lensbaby Soft Focus Optic /340) all are very basic glass to element ratios for lens designs. I do a pinhole test to determine if a lens might have good UV transmission. Wonder if the same could be done with the *ist to see how much UV the older hotmirror passes? Would love to hear more of what you come up with. This is a new learning curve for me, so appreciate any extra insight others come across. What is the pinhole test? I think he meant making pinhole camera which doesn't contain glass lens that could block UV. I plan to try using vintage lens since they may not contain AR coatings and optical cement blocking UV. Last edited by avalon11; 01-02-2019 at 06:10 AM. I think he meant making pinhole camera which is doesn't contain glass lens that could block UV. I plan to try using vintage lens since they may not contain AR coatings and optical cement blocking UV. Gotcha. So... test sensor with pinhole then look at lenses to see if they work as well or attenuate the light in that spectrum. Sorry for the delayed response but you folks have the idea. I use a pinhole cap on my converted camera and then shine a specific bandwidth light on teflon behind the lens I would like to test for UV transmission. The clearer the image the better the transmission, the more purple or muddier haze the worse transmission. Also by calculating time of exposure gives an idea of transmission potential. My thought for testing a non converted *ist would be to use a pinhole with a specific filter set in front and then try in sunlight or with a known bandwidth light and measure exposure time. This might give us an idea how sensitive the hotmirror in that older camera actually is. Even if it cuts a fair amount of UV it might still be possible to use on a tripod with longer exposures (instead of handheld) with out converting the camera. These folks are a wealth of information and I find their sites to be a "go to" when I'm facing more questions than answers. I think it is best to test with UV pass filter that allows no visible light like ZWB1 or if you can afford UG11 or U340. To test lens or hot mirror I shine 365nm LED through them to see if there is shadow produced on fluorescent material, but again it's advisable to filter pure UV light. Definitely. Only problem for me is affordable dedicated UV lights only go down to about 365nm, most in the 380nm to 395nm range. Fortunately I have a mineralogist friend with access to other wavelengths and was able to test my Steinheil and Lensbaby with those. I use the 365nm light a lot with the U360 or BG3 filter and a modified flash or straight sun with the U340. Found the filters aren't that expensive if I stay with 52mm or smaller - much cheaper than buying lenses only to find out they don't transmit that well since I prefer to hand hold shoot. There was a seller on ebay (uviroptics) who had good quality filters for a reasonable price, don't know if they are still listing.